○ Do you feel moved to commit your life to God and his people? ○ Are you attracted to the Spirituality of Anne Marie Javouhey? ○ Over 21 years of age? ○ In reasonably good health? Could it be, that God calls you to be a Sister of St Joseph of Cluny? Come and See! You need to have contacts in order to see things for yourself and be directed in your choice. If you feel you are called, you should go to a "welcoming" community for a period of preliminary formation. This is the first step towards religious life which would help you to see if your calling were in keeping with the spirit and mission of the Congregation. You would get to know us and we would get to know you. If you still feel called, you would then be admitted to the novitiate. 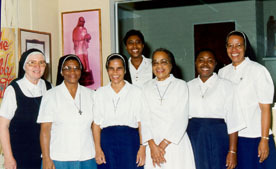 During the second year of the novitiate the novice spends some time in a community. Here she tries to harmonise her prayer life with her apostolic and community life. After evaluating the experience she has lived, she makes the request to pronounce vows for three years. It is only after six years of temporary vows that the young religious consecrates herself definitively to God by perpetual profession. "It is not the end of the journey; it is but the beginning of 'God's Today' to be lived 'in attentiveness to the Lord's continuous call'". Prayer is essential and it is given a very important place. There has to be an attitude of true listening to the Word of God, of waiting, of selflessness, of welcome so that Christ's life in us may be seen in all our daily contacts. To evangelise means to throw in our lot with our brothers and sisters no matter where they be, no matter what their specific needs, to be among them as "those who are sent" and who bear witness to God's love. It is in this disposition that we try to become one with the people in the milieu to which the Spirit sends us. This attitude demands "renouncement" which is something that is never achieved; it has to be interiorised in prayer before being lived. It exacts detachment and real poverty. 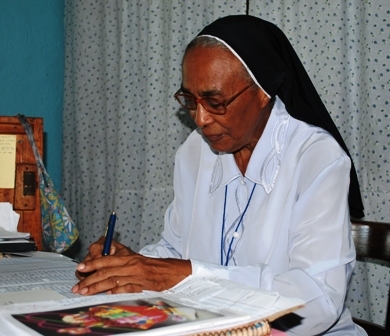 This poverty liberates us for the mission, enables us to understand those most in need and to be all things to all in cordial simplicity after the sincere example of Anne Marie Javouhey. "Community life and consecration are closely linked. The community helps us to live the evangelical counsels of obedience, chastity and poverty; these in turn unite us at a deep level and give to our community life all its spiritual significance". (Constitutions, Art. 51). Each community adapts to the times in the place where it is situated. It draws up a concrete project to try to fulfil the mission entrusted to it. The community is the sign of a life in sisterly love where interpersonal relations are genuine and deep. 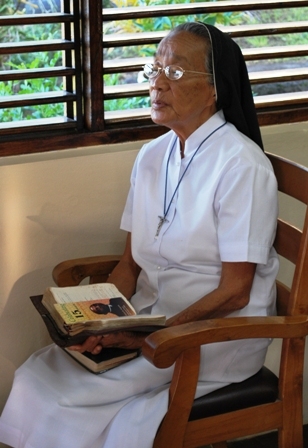 Copyright 2014 - Sisters of St. Joseph of Cluny in the Caribbean all rights reserved.